UPDATE (6/13): And now it’s official. Today at their press conference, Microsoft announced the Xbox One S, which will be 40% smaller than the Xbox One. It’ll start at $300 and be out this August. Pricing will vary based on the hard-drive size, Microsoft said. 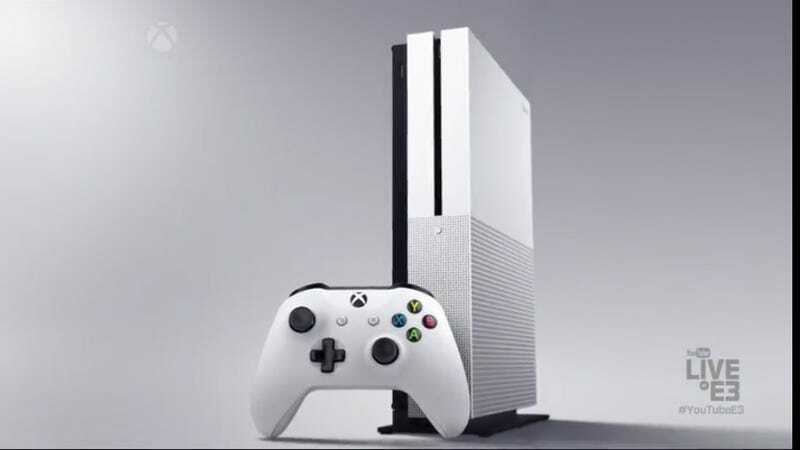 The 500GB version will be $300; a 1TB version will go for $350; and a 2TB Xbox One S will be $400. Just one day before Microsoft’s press conference, an image of the Xbox One Slim (aka Xbox One S) has popped up (h/t NeoGAF). The Slim, which is code-named Edmonton, will have a 2TB hard drive and be significantly smaller (40%) than the original Xbox One. It’ll also support 4K video. We believe it’ll be out in the next couple of months, perhaps in August. Kotaku first broke news of the Xbox One Slim last month. Microsoft is also working on a more powerful version of their console, codenamed Scorpio, which will be released in late 2017. More news tomorrow at Microsoft’s E3 presser.